A Literary Odyssey: Sherlock Holmes: A Study in Scarlet. I am also choosing to read them this way since, from my prior experience reading Doyle's work, the two characters reference old cases in later books. This way I am going through the mysteries right along with them! The first selection is the debut novel, A Study in Scarlet. This was the world's first introduction to Holmes and to Watson. I had never read this particular Holmes story before, so I was curious as to how the relationship between Holmes and Watson began, as well as how Doyle was going to develop their characters. I am glad that I got to find out much more of the history of both characters. 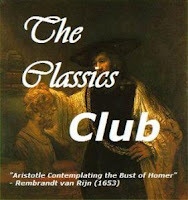 We learn in the first three chapters much of their histories before the novels and stories take place. Watson was a doctor in the army and only came back to England after he suffered an injury. Upon returning home, an old friend runs into him and upon hearing that Watson is looking for rooms, offers to introduce him to Holmes, who is looking for a roommate. That is how Watson and Holmes meet. For some reason, I always had the impression that they were longtime friends (not sure why), but I am glad to see they befriended one another later in life. Once living together, Watson and Holmes have to learn each others habits. I really like how the character of Watson is narrating. Obviously it makes it easier for Doyle. 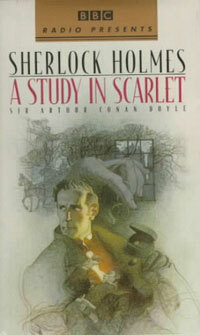 Had Holmes been the narrator, he would let the reader know the answers as Holmes discovered them. Watson makes a perfect narrator. He is smart enough that we can trust him to ask the right questions, and makes the guesses we would make if we were in his position. I also love Watson's interpretations of Holmes' character. Anyway, the back history has really helped to develop both characters in my mind and to see how they have the relationship that they do. 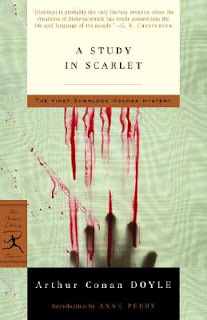 The plot of A Study in Scarlet surrounds a mysterious murder of a foreigner (and American). Based on only a few clues that the police detectives don't see, Holmes eventually discovers who the murderer is, and JUSTICE! I don't want to give away too many details to ruin it for you, but that is the jist of the plot after the first three chapters of back story and exposition. One thing that stuck out to me is that halfway through the novel, the pace completely switches gears. The first half of the novel is the discovery of the murder, the race to catch the murderer, and the eventual capture. The second half launches into something completely different. The reader is transported to a completely different time and place to get the back story of the murder and why it happened. While I understand that Doyle needed to explain how everything got up to that point, it felt extremely disconnected and I felt like I was reading a com pletely different novel (he was talking about Mormons. I mean, we went from capturing a criminal in London to Mormons settling in Utah in a matter of 2 pages). I wish Doyle had found another way to give us that history without jumping so drastically. That being said, I loved the build up of the history. It made the murderer into a person that the reader could actually like and admire. Not because he committed murder, but because of what he went through and the lengths he went to for justice (even if that begs the question, can we or should we take justice into our own hands?). 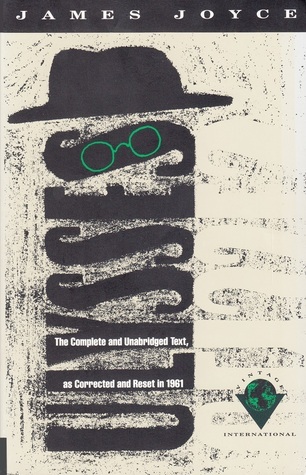 The result was a fun and fast-paced novel. It set up the relationship between Holmes and Watson beautifully, and set the tone that Holmes was no ordinary detective. I am hoping that the next novel The Sign of the Four is just as wonderful to read! I did enjoy this one but you're right, the pace is completely different in the middle. I don't think Doyle did anything like this in his other novels/stories, at least not to this degree. I'm excited to follow along w/ your Holmes reading - and I might join you to read some of the stories I haven't gotten to yet. I've been tossing the idea around of reading Doyle...you're post is making me think that I should!! !